Does the word “love” belong on the title of a metal album? Any metal album? While it is hard to imagine it being used in death metal (unless it is a love of impaling your adversary) or true black metal (unless it is a Satanic perversion of some sort), the avant-garde metal could be more receptive. For example, Spanish avant-gardists As Light Dies had no qualms naming their most recent release The Love Album – Volume I. Not familiar with the band heretofore, I was not sure what to expect. 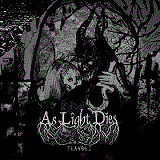 And having listened to the album multiple times I am still hard pressed to describe exactly the genre As Light Dies is playing in. For starters, the album is replete with short interludes ranging in atmosphere from seductive to horror-movie creepy. These interludes, in fact, alternate with full-length compositions providing pause in the action and ratcheting of tension at the same time. But it is the full-length compositions on The Love Album – Volume I which are impossible to describe. Orpheus Mourning jams three different styles and five different songs, all in the span of just under 8 min. From blackened rush to gothic crooning to strange jazzy stumbling to melodic tremolo and even female vocals to boot, everything in Orpheus Mourning is both unsettling and unexpected. In some moments you wish this concoction to stop, in others you want it to last a little longer, as you are beginning to get a hang of it. Together as One and Farewell from Distant Shores begin with industrialized harshness, while Nemesis pretty much stays in this rougher groove throughout, and I have to say I did not care much for those moments. Yet those austere rugged passages eventually dissolve and give way to more fluid atmospheres, to soothing caress, reminding me of the Vintersorg progressive era moments in its grandiose end (Together as One) or adding some brass sound instrumentation (real horn or trumpet?) before floating away in piano passages (Farewell from Distant Shores). Complex and progressive, vocally, however, As Light Dies is not Vintersorg, the vocals on The Love Album – Volume I never becoming too aggressive or way sweet. My favorite composition, in time, I might add, became Your Wake, where hurried beat brings on some minor chord keyboard sequences, and for once the band actually repeats their good finds several times. Eventually though, As Light Dies folds that tent, replacing it with their take on Depeche Mode, which in itself is only a prelude to an expansive finish. The Love Album – Volume I is intellectually challenging and will require your concentration to follow its twists. I suspect some will find these travels extremely rewarding, if they don’t mind to be jolted with changes often. Others, and we should not blame them, will never make sense of it all, or why this is called The Love Album in the first place. Only fitting that Dan Swano produced, mixed and mastered this complex pieces of extreme music.